Two admirable journalists write about the agreement reached last Saturday by the Great Powers (“P5+1”) with the evil Iranian regime, both comparing it to the agreement Neville Chamberlain thought he had secured with Adolf Hitler in 1938. To adapt Churchill : Never in the field of global diplomacy has so much been given away by so many for so little. Britain and France’s capitulation to Nazi Germany at Munich has long been a byword for ignominy, moral and diplomatic. Yet neither Neville Chamberlain nor Édouard Daladier had the public support or military wherewithal to stand up to Hitler in September 1938. Britain had just 384,000 men in its regular army; the first Spitfire aircraft only entered RAF service that summer. 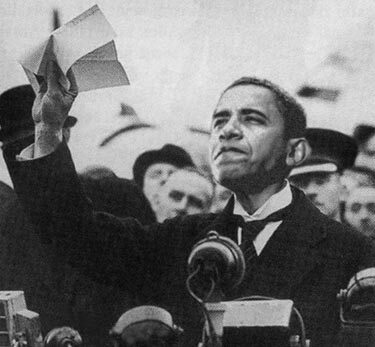 “Peace for our time” it was not, but at least appeasement bought the West a year to rearm. The signing of the Paris Peace Accords in January 1973 was a betrayal of an embattled U.S. ally and the abandonment of an effort for which 58,000 American troops gave their lives. Yet it did end America’s participation in a peripheral war, which neither Congress nor the public could indefinitely support. “Peace with honor” it was not, as the victims of Cambodia’s Killing Fields or Vietnam’s re-education camps can attest. But, for American purposes at least, it was peace. By contrast, the interim nuclear agreement signed in Geneva on Sunday by Iran and the six big powers has many of the flaws of Munich and Paris. But it has none of their redeeming or exculpating aspects. Consider: Britain and France came to Munich as military weaklings. The U.S. and its allies face Iran from a position of overwhelming strength. Britain and France won time to rearm. The U.S. and its allies have given Iran more time to stockpile uranium and develop its nuclear infrastructure. Britain and France had overwhelming domestic constituencies in favor of any deal that would avoid war. The Obama administration is defying broad bipartisan majorities in both houses of Congress for the sake of a deal. As for the Vietnam parallels, the U.S. showed military resolve in the run-up to the Paris Accords with a massive bombing and mining campaign of the North that demonstrated presidential resolve and forced Hanoi to sign the deal. The administration comes to Geneva fresh from worming its way out of its own threat to use force to punish Syria’s Bashar Assad for his use of chemical weapons against his own people. As for Israel, it cannot afford to live in a neighborhood where Iran becomes nuclear, Assad remains in power, and Hezbollah — Israel’s most immediate military threat — gains strength, clout and battlefield experience. The chances that Israel will hazard a strike on Iran’s nuclear sites greatly increased since Geneva. More so the chances of another war with Hezbollah. After World War II the U.S. created a global system of security alliances to prevent the kind of foreign policy freelancing that is again becoming rampant in the Middle East. It worked until President Obama decided in his wisdom to throw it away. If you hear echoes of the 1930s in the capitulation at Geneva, it’s because the West is being led by the same sort of men, minus the umbrellas. The article is valuable as an erudite and accurate assessment of the Geneva sell-out. But Stephens’s visualization of what the “after Geneva” Middle East will look like, bad though it is, is too mild. We predict that Iran will become armed with nuclear weapons and will use them. America and Europe’s overwhelming desire to declare a deal meant that there had to be a deal to declare. The P5+1 countries, with the ludicrous Catherine Ashton speaking for Europe, have indeed made a historic and terrible mistake. The mullahs did not come to Geneva because they wished to give up their capability. And they did not come to the table because after 34 years of revolutionary Islamic governance they have seen the error of their ways. They came because international sanctions were beginning to hurt. Those sanctions – which took years to put in place – have now fallen apart thanks to a few days of incompetent negotiating on the part of the P5+1 plus some simple common sense from Tehran. People tend to say at this stage that the Iranians are ‘master negotiators’. They aren’t especially. They are simply fortunate to be playing against Catherine Ashton and a generation of other weak and short-sighted American and British politicians. The result is that the Iranian regime has managed to walk away with a deal to relieve the pressure of sanctions at the very moment that the pressure was working and the very moment that it should have been kept up and ultimately used to break them. They now have the breathing hole they need to reinforce their power at home and continue their search for nuclear weaponry. At the root of this debacle is the fact that the Iranians went into the sanctions knowing exactly what they wanted: time and the bomb. The P5+1 countries, by contrast, were riddled by doubt and muddled thinking. There should only ever have been two aims with regard to the Iranian regime. The first is to ensure that it never ever gains the capability to develop nuclear weapons: not only to ensure that the world’s most destabilising regime never possesses the world’s most dangerous weaponry, but to ensure that it cannot precipitate a nuclear arms race across the Middle East. The second aim, and one which appears to have slipped even further down any international agenda, is to see the end of the brutal rule of the mullahs. Sadly this does not even appear to be on the table any more. Ever since President Obama failed to come out in support of the brave Iranian protestors who rose up in 2009, the basic human rights of the Iranian people have been ignored utterly. So what that the regime promotes terror around the world? So what that it oppresses, rapes, tortures and executes its opponents at home? By negotiating with this regime and allowing it off the hook at this moment America, Britain and our allies have not only given a stay of execution to the mullahs, we have further undermined the hopes of any opponents of the regime inside Iran. The Schwarzenbergs were Austrian princes. There is an equestrian statue of Prince Karl Philipp (1771-1820) in the Schwarzenbergplatz in Vienna. But more interesting to us is the Schwarzenberg who was one of the leaders of the troops against the Ottoman Turks in the Battle of Vienna in 1683. Although outnumbered, the Austrians beat the Ottomans, and by doing so stopped the advance of Islam into Europe. The victory marked the start of the Habsburg dynasty. It was also (so legend has it) the occasion for which the delicate croissant bread roll was invented to commemorate the defeat of the Muslim armies with the crescent on their flag. And ever since then, the Schwarzenbergs have had the head of a Muslim on their coat of arms. During the Second World War, a Schwarzenberg duchess in Czechoslovakia, ancestress of Karel, refused to speak German to the Nazi occupiers although it was her native tongue, always using an interpreter to make communication as difficult as possible. Now that Islam is conquering Europe by stealth, it may be a hopeful sign that once again a Schwarzenberg is in a position of authority and speaking out against the renewed advance of militant Islam.